The Brookings-LSE Project on Internal Displacement indicates the increasing intensity and frequency of worldwide disasters demonstrates the critical need to enhance disaster risk management. In the Caribbean, for Small Island Developing States (SIDS), there is a substantial risk and vulnerability to natural disasters such as severe storms and hurricanes. SIDS face a range of potential disasters brought on by no fault of their own due to settings of tectonic plates, location and topography, according to the United Nations Development Program (UNDP). Once disasters strike, SIDS are hampered further by their poor use of land and relative poor management policies as pertaining to their environment. For example, many governments in these island nations allow the citizens to buy property and build their homes on flood-prone, landslide areas at a fraction of a price, while failing to put proper safeguards in place to prevent unnecessary loss of life when disasters strike. Another substantial risk is climate change and global warming, which is now creating storms and hurricanes outside the norm of hurricane season. On Dec. 24, 2013, a low-level trough—an elongated area of relatively low atmospheric pressure—pummeled the islands of Saint Lucia and the Commonwealth of Dominica. St. Lucia Online News indicated that the trough brought with it heavy rains, severe thunderstorms that caused island-wide flooding, power loss, massive blackouts, landslides with heavy damage to roads and infrastructure and the collapse of several bridges. In the Caribbean, when hurricanes and storms wreak havoc, the island hit by these weather systems will trigger their national disaster management plans to coordinate their emergency response operations. The Caribbean Disaster Emergency Management Agency (CDEMA) initiates the Regional Coordination Plan and activates elements of the Regional Response Mechanism to provide the operational and logistic support needed. The CDEMA is a regional inter-governmental agency for disaster management in the Caribbean community. Though the CDEMA provides a vital service to the Caribbean Basin, it is simply not enough. There is a need for the SIDS to develop a more international approach. Currently there is a heavy dependence on citizens from the various islands living abroad, individuals and Caribbean organizations as the chief means of implementing an international approach to administration of disasters. The CDEMA is limited financially. Individuals and Caribbean organizations are also financially limited. They can ramp up funds and receive donations to send to their island for a brief moment in time, with the windows of opportunities to receive these donations closing rapidly. However, there are resources available in the United States and Canada to assist in the public administration of disasters. The United States Agency for International Development (USAID), through the Office of Foreign Disaster Assistance (OFDA), is responsible for coordinating U.S. government emergency assistance overseas. 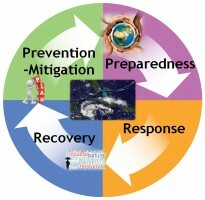 OFDA has funded and provided training for the Caribbean in areas of disaster risk reduction. Furthermore, in collaboration with the American Red Cross, OFDA has been involved in the “Saving Lives in the Caribbean through Preparedness” and the “Readiness to Respond” projects. The Canadian International Development Agency (CIDA) has also been actively engaged in disaster management projects in the Caribbean. As part of CIDA’s Caribbean Disaster Risk Management Program (CDRMP), the Canada-Caribbean Disaster Risk Management Fund has been established, providing grant assistance for small-scale disaster risk reduction projects. When these storms and hurricanes hit the Caribbean, assistance also comes through the Japan International Cooperation Agency (JICA), which rallies around the Caribbean islands and assists them in rebuilding. The SIDS are also eligible for loans from the World Bank. Lastly, the European Union (EU) has also engaged Caribbean disaster management institutions to contribute to disaster risk management and to facilitate the reduction of the social, economic and environmental impact of disasters in the region. Even with assistance, SIDS are still not as prepared for disasters. There is a heavy reliance on the international community for assistance in the rebuilding process. One reason is SIDS do not have a sufficient financial cushion to help rebuild their communities after disasters strike. On the other hand, some of these SIDS have very poor disaster preparedness plans in place, allowing citizens to build homes in some of the most dangerous, flood and landslide-prone areas of their islands. In addition, the disaster relief organizations in the Caribbean, local and international, do not do a good job of collaborating with each other. As a result, it has led to duplicated efforts and poor communication. It is recommended that CDEMA and the international agencies develop a coordinated strategy framework beforehand that can lead to increased coordination and more effective disaster management in the region. Author: Peter Lyn René is a political consultant in Houston. He has a Bachelor’s degree in political science and a Master’s degree in law and public policy. Peter is the chairman and chief executive officer of The Singing From The Soul Foundation, The Caribbean American Heritage Foundation of Texas and The Saint Lucia Foundation of Texas. He serves on the executive committee of the United Nations Council of Organizations.